The Peterson NEW Split Oak Designer Plus series is extremely realistic. Built by the Robert H. Peterson company (the ORIGINAL gas log manufacturer for over 45 years) they carry a lifetime warranty against breakage. Each log goes through four seperate steps of hand painting to give it the most realistic detail available today. 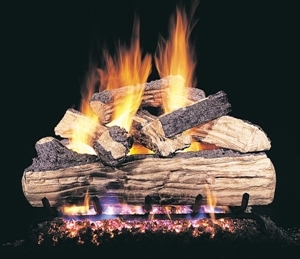 All Peterson sets include the logs, custom grate to replace the wood grate you may already have, silica sand to spread out the flames and a front bed of glowing embers as well as an installation kit, damper clamp, tubing and fittings. These logs are to be used in a vented, fully functioning, normally wood burning fireplace. If your fireplace is several years old, it is recommended that you have it cleaned by a certified professional chimney sweep before installing gas logs. You'll never have to purchase wood again!